My school had our Thanksgiving feast the other day and boy do I have a lot to be thankful for…..I have a cool dog, I have rooms full of toys, I eat lots of candy, I run the show at my house….it’s good to be king. And I know school cafeterias have a bad reputation for food quality, but my school makes the best pumpkin pudding EVER!!! I look forward to this feast every year just for that alone. My folks weren’t wild about trying it so I ate theirs – yummo! I thought my folks skipped the pudding because they wanted to save room for the turkey, potatoes, dressing, green beans, and rolls, but they didn’t really eat much of that either so not sure what they know that they’re not telling me. I was fine in my ignorance-is-bliss-world eating the turkey, potatoes, and rolls. After all the pudding was gone, I hung out with some friends before heading back to class. I think I ate too much tryptophan in the turkey because I could’ve used a nap….or more pudding. I’ve been meaning to get better about posting, but my schedule has been full and keeping me busy — 3rd grade is for real! Anyway, some highlights from the last few weeks…I passed my Green Belt test in Taekwondo so I’m one step closer to being a lethal weapon.The test was harder because there was a lot more material to know, but Confucius says “the man who chases two rabbits catches none.” In other words, focus is key so that is what I did. I centered myself and calmed my nerves and performed like a high-kicking, board-breaking rock star! Over the past couple of weeks I also got in touch with another side of my roots by going to the Greek Food Festival with daddy and grannie. This is the side my last name comes from, but we know very little about so we figured we could get caught up at a festival — yeah, not so much. But we did have some fun playing with sand. Opa! And then here’s a couple of pics from when grannie came to have lunch with me for grandparent’s day and then GiGi and I tying to get some rest. 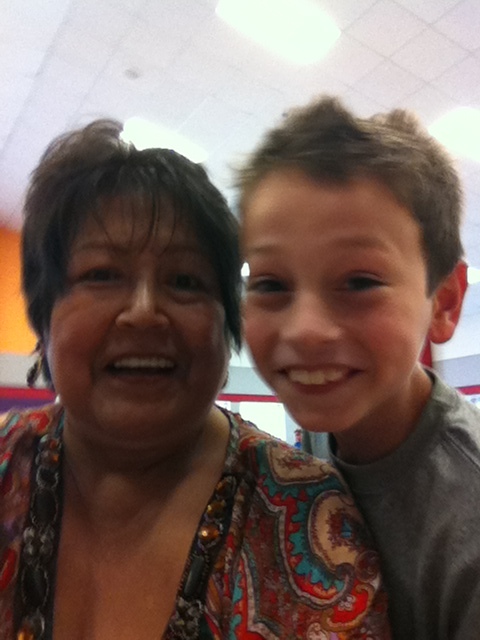 The pic with grannie was sneaky on my part because she told me she wanted to take a selfie in my cafeteria and didn’t want me in it, but I photobombed with a big smile and showed her….hmmmm….I may have been played, nah! I’m sure she really came to have lunch with me hoping to get a selfie without me in the picture. So I’ve been taking Taekwondo for the past 6 months and earned my orange belt in July. This means I’m no longer considered a beginner belt, but rather an intermediate belt which means we do more push-ups and sit-ups…oh, and that I got skills. 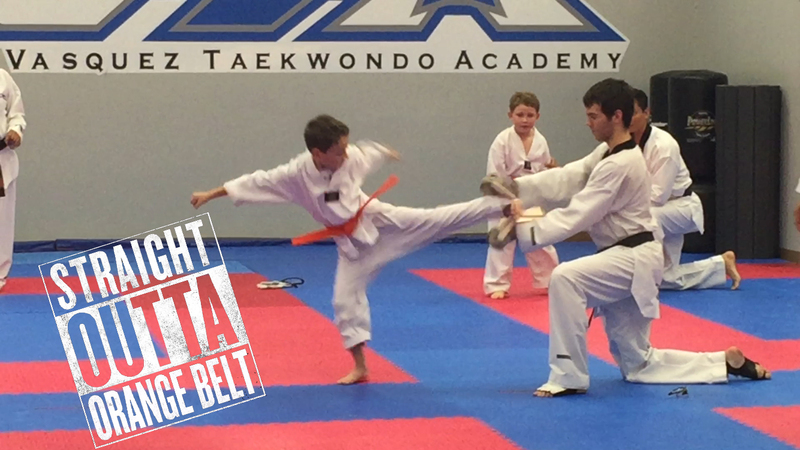 Here’s a video from my belt test. This past weekend, I got the chance to experience something totally new and totally cool. I got to basically be in my own personal Minecraft game because I went digging for diamonds! Grannie and I packed our gear and headed out on a road trip to the Crater of Diamonds State Park in Murfreesboro, AR to get us some bling. My plan was to get enough diamonds to make mommy some new earrings, a necklace, and maybe a bracelet. Of course, that was after I cashed out a few diamonds to buy Toys-R-Us and, yes dad, pay for my college. Well, Toys-R-Us is safe, mommy will have to make due with CZ’s, and don’t cash out the savings account just yet dad because we came up completely diamond free. We did, however, have a great time. It was HOT!! Grannie made me drink so much water I thought I was going to pop, but that was the right thing to do, I know. There was a water park right next to the dig site so we dug until we couldn’t dig anymore and then cooled off by playing in the water. Even though we didn’t find diamonds, we found a lot of riches in the new experiences and quality time with my Grannie. I will remember it for the rest of my life and hope she does too! Yep, after years of having emotional discussions about whether or not we were ready for another mouth to feed…..it would complete our family……the sleepless nights……the joy it would bring……the potty training……and how it would mean I would have to share my parent’s attention……my parents finally concluded the positives outweighed the challenges we could face and decided we could get a puppy! So then, we had to decide what kind of puppy we wanted. It had to be something we all agreed on. I wanted a little puppy so I could play and cuddle with it and also have it sleep with me — we’ll get to that later. So my dad didn’t want a little dog like a Chihuahua — he wanted a Labrador Retriever like Old Yeller (of course, I think he was hoping for a better ending). Mommy didn’t want a big dog — she wanted a little dog that would have little poops. So here is where I came in and said we should get a medium-sized dog — it’s not rocket science people. So we researched which breeds were good with kids, personable, and easy to train, then we went to the SPCA (Russell H. Perry Animal Care Center) and just picked the prettiest one we saw — research out the window. We did luck out though because we got a Boxer mix. Mixed with what? Who knows – papa was a rollin’ stone. They think she is most likely mixed with an Australian Shepherd or Australian Cattle Dog because she has a blue eye. 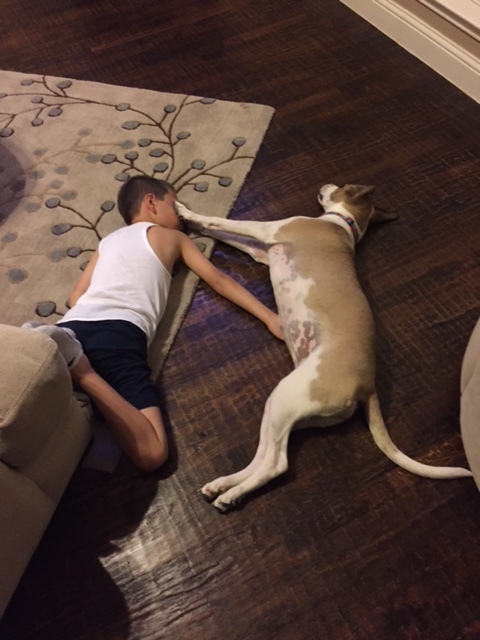 The Boxer side of her means she will be very smart, personable, playful, and puppy-like for longer than most dogs. The Aussie side means she will be even smarter, but needs to be challenged mentally or she will create her own little tasks that we may or may not like. Oh, and the Aussie in her means she likes to herd so she has a tendency to nip at our feet when we don’t do what she is wanting. Remember all of the cute little expectations I had for a puppy — cuddling, playing, sleeping, yadda, yadda, yadda — well, she certainly loves to play, but there is no chance I would let her sleep with me because she uses the bathroom too much. AND it has been raining ever since we got her so she always smells like a wet dog. She also likes to chew a lot even if it’s on me which is natural, but she doesn’t know how sharp her little teeth are so I have to be careful about that. Overall, she’s been a good girl and lots of fun. Oh and as for how big she will get, we are telling mommy she will be smaller than an average Boxer, but her poop is definitely bigger than a Chihuahua’s. And now, here’s GiGi — stands for Good Girl, but daddy calls her DD sometimes for Darn Dog (PG version)…. She tried to make us think she was sweet….